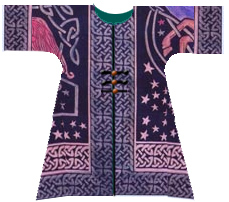 Here are instructions on how to make your own Wizard's Coat. 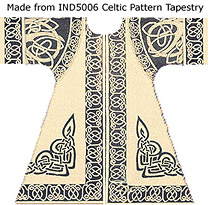 You will need about four yards of 45" cotton broadcloth for the lining and a full-size (88" by 106") printed cotton tapestry throw with a Celtic knot work border. 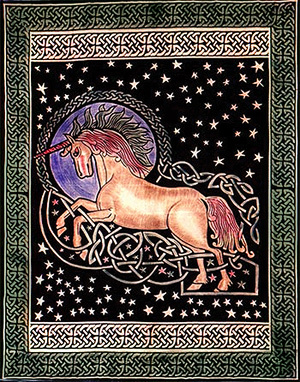 The one used here is the Celtic Unicorn Tapestry. Wash and dry the lining and the printed tapestry throw to stabilize shrinkage. Cut the hemmed edge off the throw or use a seam ripper and open the hem. IMPORTANT: Fold the throw in half length-wise, along the vertical axis. Then fold it again across the horizontal axis. Smooth out the wrinkles in all four layers. 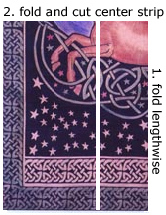 Fold 3 yards of the 45" broadcloth in half length-wise, then width-wise and lay on top of the throw, lining it up on the slelvedge side, not the fold side. Using the edge of the folded broadcloth as a guide cut the center strip of fabric off the throw. The extra yard of broadcloth and this center strip will be used for making the sash, gores and cuffs. When opened up, the center strip should measure about 108" by 40". Cut two cuffs, 20" by about 6" or the width of the fancy border, from one end of the center strip and two more from the broadcloth for lining the cuffs. Set the rest aside for now. The other stack of folded fabric will be used for the body section and its folded width should be between 22" and 23". "A" equals the measurement from your waistline in the back, up and over your shoulder, to your waistline in the front, divided by 2. "B" equals your waist measurement divided by 4, plus 1". "C" equals your hip measurement taken 5" below your waistline divided by 4, plus 1.5". This pattern is so simple that you can just mark it on the top layer of the broadcloth with chalk, cut through all four layers of broadcloth, remove the excess cloth, then use the broadcloth as the pattern for the printed fabric. The top of the diagram to the left indicates the shoulder fold, the left side is the selvedge of the broadcloth, and the bottom of the diagram is the hem. Measure 1" down from the top fold along the selvedge of the broadcloth and 3" across. Connect these two marks with a curved line. Cut through the four layers of the broadcloth to create the neck. To refine the shape of the front of the neckline, measure 3" down from the cut on the selvedge. Draw a curved line from this mark to the shoulder mark. This time, when you cut the curve, only cut through the top two layers. This will make the neckline lower in the front than in the back. On the right side, measure 10" from the fold and draw a straight line parallel to the shoulder fold about 9" long. Measure from the shoulder fold "A" inches and mark the level of your waistline. Measure from the selvedge "B" inches along your waistline level and mark the end of the waistline. Draw a line parallel to the selvedge from this waistline point toward the shoulder until it meets the sleeve line. Since you don't want to cut this out with a 90° angle you must modify the angle by connecting the bodyline and the sleeve line with a 3" to 4" radius curve. This curve can be refined during fitting, later, if you have someone to help with the fitting. The tighter the curve the more fitted the bust will be. 10" is a rule of thumb for a sizes X on the folded sleeve width. For other sizes it should be half your upper arm circumference plus 1.5". Next draw the skirt line from the waist point to 1" above the corner of the fabric at the hemline. Measure down from the waist line 5" and "C" inches horizontally from the selvedge and mark the hip point. If this point falls to the right of the skirt line you will need to add side gores. If it falls to the left of the skirt line, you don't need side gores and can skip the next step. If you need side gores, pin or tape paper under the right side of the broadcloth to make a pattern for your side gore. Angle your skirt line so that the hip point falls to the left of the skirt line and continue the line off the end of the fabric onto the paper. Measure the broadcloth on the folded edge from the skirt line to the hemline. Mark this side gore length on the paper 1/2" under the edge of the fabric . Mark the side gore length on the skirtline as well. Connect these two end points with a curved line to form a pie wedge. Unpin the pattern and use it to cut your gores out of the center scrap fabric where the pattern matches best. 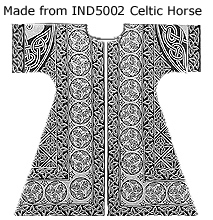 Now that you have the pattern drawn on the broadcloth you can cut out the coat. If you have side gores, slip your scissors into the right side fold and cut it open. Cut open the sleeves at the cuff line, too. Leave the shoulder fold uncut. Remove the excess fabric and use the broadcloth as a pattern to mark the printed tapestry fabric. 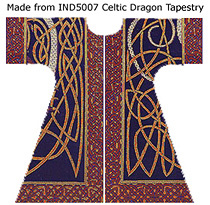 After marking the outline, remove the broadcloth lining and cut the tapestry fabric. Warning: If you try to cut through all eight layers at once with normal scissors, you will have problems. Measure the distance from the hem to the waistline on the selvedge. This is your back gore height. The width of the gore should be between 10" and 20" depending on your size and how much fabric you have. Cut one back gore from both the tapestry fabric and the broadcloth. If you are very thin, you can do without the back gore. Cut the last long piece of the center fabric in half length-wise for a sash if you want one. Sew the middle together so that the fancy borders are on the ends of the sash. If it is too long, take the excess out of the middle and re-sew. Sew together length-wise and across one end. Turn and sew the other end. Completely assemble the outside of the coat first before the lining. Assume that you always put right sides together and serge the seams or sew with a straight stitch at 1/2" then zigzag the edges to finish them. Sew the back gore to one side of the back seam from hem to waist. Pin the other side of the back to the back gore and pin the rest of the back seam to the other back. Sew the back seam from neck to hem. Pin the cuffs to the sleeves and pin the side seams from the cuffs to the waistline, then try the coat on. You may need to remove a little of the sleeve before attaching the cuff if the sleeves are too long. 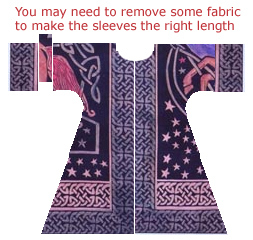 Remove the same amount from the lining sleeves. Refine the fit as necessary. If you have side gores, sew the side seams the same way as the back. Otherwise, just sew the side seams together from cuff to hem. Assemble the broadcloth lining the same way except for the cuffs. Sew a lining cuff into a tube and slip it over the tapestry sleeves with right sides together and sew around the end of the sleeve. Repeat on the other sleeve. Put the coat and lining together. Have someone help you even up the hem keeping as much of the border in tact as you can. Pin lining to coat and sew up one side of the front, around the neck and down the other side of the front opening. Then sew all around the hem. Turn the garment right-side-out through one sleeve opening and press. 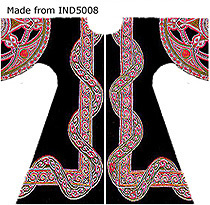 Top-stitch front opening and neck line. Sew lining cuffs to lining sleeves and finish with a French seam, surged seam, or bias tape. Top-stitch around the cuffs. The outer fabric should turn in a little. 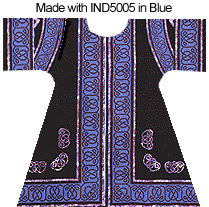 You can do without buttons in the front if you made a sash to close the coat. Otherwise, add frogs, clasps, or buttons to the front and you are done! 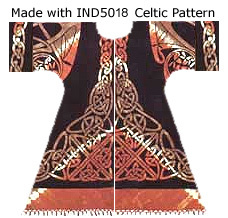 If you want to add this article to your list of favorites or email it to a friend, please use this permanent URL, https://stores.renstore.com/-strse-template/Celtic_Coat/Page.bok. Permission is granted by the author to quote from this page or use it in handouts as long as you include a link back to Renstore.com.